Are the UA Headphones Wireless the best sounding headphones? Probably not, but you might still want them. Keeping the earbuds in your ear is one of the more important aspects of workout headphones, and these excel at that. The fitness market has been booming, and the trend continues with the new UA Headphones. It seems like every company big or small is trying to get into the audio game, but it doesn’t always work out. In this case, it looks like it might. 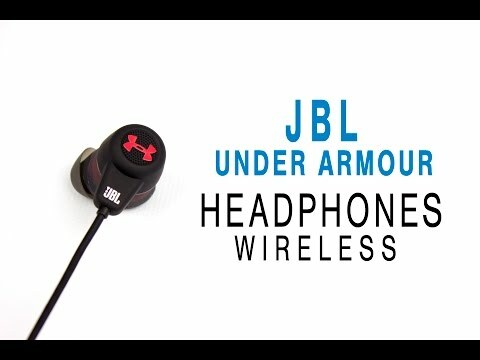 JBL is known for quality sound at affordable prices and Under Armour is one of the biggest brands in the fitness world. So the product of their partnership should be the perfect pair of fitness headphones, right? In the box you’ll get the headphones, a small soft shell carrying case with a cool mesh interior, a micro USB charging cable, an extra set of ear tips, and the warranty information and instruction booklet. Buried in all that is also an access code for a free premium subscription to MapMyFitness for 1 year. The build is what you’d expect from a pair of exercise headphones. They have a nice plastic build and come in all black with red accents. On the back of each earbud is the UA logo in red with the small JBL branding underneath in white. It’s not the prettiest, but there’s really nowhere else to put it so it’ll do. These have an IPX5 rating which means that they can survive a rainstorm as well as your sweat with no problem. That said, they don’t look like they’d withstand any serious physical stress. JBL claims that these internal and external strain reliefs, but it still feels like a good tug would tear them apart. We didn’t test this out obviously, but hopefully we’re wrong. Design-wise these aren’t the most unique looking pair of ‘buds, and for the most part look a lot like every other pair of wireless earbuds on the market. The earbuds are connected to each other by a wire with a small control module on it. As is the case with most other headphones, this module is where you’ll find the mic and three control buttons. Where these actually do differ from other earbuds is in the shape of the earbuds themselves. They are noticeably bigger than other ‘buds on the market and that’s because they feature JBL’s new TwistLock Technology, which is supposed to keep them firmly in your ear while you exercise. At first I wasn’t a big fan of this because they just wouldn’t stay in my ears. I would’ve taken smaller ‘buds with wing tips any day of the week but after switching out the ear tips for the included extra pair, they worked perfectly and made me a believer. No amount of shaking my head can get them to fall out whether I was sitting at my desk or out for my morning run. That said, these headphones achieve this by basically wedging itself in your ears, so it can be a little uncomfortable after a while. You won’t notice it while you’re wearing them, but your ears will give a little sigh of relief when you take them out. No pain, no gain. Pairing to the UA Headphones Wireless was really simple. I did have a small issue at first and I was forced to repair, but since then there’s been no issues at all. The connection is strong up to it’s range of about 30 feet and even passed that there was only minimal skipping. They didn’t skip once while running with my phone strapped to my arm, so if you keep it on your person you won’t have a problem. Because it’s Bluetooth, playback controls work great on both Android and iOS. The top button raises the volume, the bottom bottom lowers it, and you can long press on either of them to skip forward or return to tracks. The middle button is a multifunction button that turns on the headphones, enters a new pairing mode, pauses/plays music, and also answers and ends phone calls. The small LED light on the module is also pretty helpful while charging and connecting to new devices. Unfortunately, there’s no Siri or Google Now functionality to be found on these so if you use them often while exercising you’ll have to reach for your phone. JBL and UA claim a battery life of 8 hours, but in our testing we got a little more than that at around 8.5. Still not the most amazing battery life in world sure, but kudos to UA and JBL for not only living up to their claim, but surpassing it. Even if it was only by 30 minutes. Charging time only took about 1.5 hours as well so throwing it back on the charger for a little while would be enough for a weeks worth of 1-hour workouts. Not bad. Being workout headphones, we did the majority of our testing while exercising. We also did some testing while commuting just to see how it fairs in everyday situations. The low end isn’t a strong point in these headphones, so if you want something with a brain shaking bass (or even regular bass) you’ll have to look to some other brand. During testing I found the bass to be a little too soft and even at max volume there’s not much power behind it. The bass in ‘Trust Me Danny’ by ILoveMakonnen is usually gritty and deep, but feels more like a regular synth in these. There’s a bit of a push in the mids which makes them great for vocals. If you like to sing along while you exercise these would be perfect for you. Vocals were clearly discernible in ‘LA Confidential’ by Tory Lanez but some background instruments do tend to get a little lost. As is the case with most ‘buds, the highs were reigned in quite a bit so there’s no harsh sounds blasting right into your ears. Unfortunately, this also means that some detail is lost in the high end but that’s a trade I’m willing to make. One thing to keep in mind is that these do not do a good job at all in terms of blocking outside noise. This is great if you’re like me and usually go for a run in the street since you want to be aware of your surroundings, bad if you want to use them on the subway to block out a crying baby. The UA Headphones Wireless are a great pair of headphones for exercising, but the sound leaves a lot to be desired. On the bright side, they’re one of the best headphones I’ve ever used in terms of keeping the ‘buds in your ears. Once you get the fitting right, they’ll only come out if you want them to. The sound on these is good enough but just not overly enjoyable. Nothing sounds amazing or super clear on these, they’re just — good. Normally we’re big fans of accuracy but while exercising sometimes it’s better to have a little more emotion in your music. It feels like these were trying so hard not to get caught up in the low-end criticisms some other brands have that they missed out on some key elements. A lot of things about these headphones tend to be a trade-off. You lose some sound quality, but they never fall out. They have an average battery life, but they charge pretty quickly. Still these do what they were designed for and there’s no doubt that they’re a really good pair of exercise headphones.